I have a coffee table which was made by my grandfather 60 years ago. 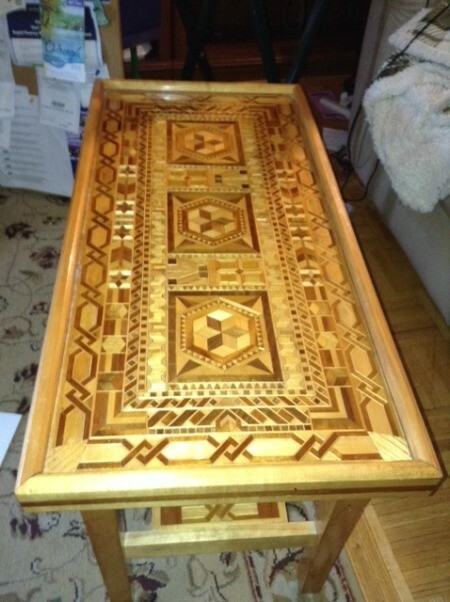 It was made with tiny individual pieces of wood, glued together to make a pattern. It is a beautiful piece, but now I have to store it in a storage unit for awhile. I am sure the unit is dry, but I am worried about the cold as it will be stored over the winter months. I am worried about the glue that holds the pieces together. I imagine it was some kind of carpenter's glue my grandfather used (this was back in the 50s at least). Anyway, my question is will the cold do anything to this one of a kind family heirloom? It's best to store fine art, antiques, and precious family heirlooms like this gorgeous table in a climate-controlled storage unit. Non-climate-controlled storage is cheap but not cheerful when you return to find your stored goods nibbled by mice/rats or split/warped/otherwise damaged from temperature extremes. Yes, climate-controlled storage will be a little more expensive than a 'regular' storage unit, but the piece will be protected from cold and heat extremes, and from pests. The storage facility should have a tips booklet with tips on preparing your goods for storage, should also have comprehensive tenant insurance available (read the contract before you sign), a pest control programme, and finally, should have security measures in place like round locks for units, keypad entry gates that log all visitors, cameras, and alarms. If they don't, look for a different facility. If you find climate-control storage is out of your budget, try to find a friend or family member you trust completely to let you store the table in their heated and cooled home. That sure is a rare and beautiful work of art! I would be more inclined to ask a very trusted friend or relative to hold that table for me, rather than put it in a commercial storage unit, even climate controlled. You just never know what might go wrong when you use a commercial facility. For instance; what if it changes owners or goes out of business, moves, has a fire, has a burglary, or someone botches your payment history and sells off your unit's contents for non-payment before you have a chance to prove you're paid-up? I would never trust such a precious item to a commercial storage place. Of course, you have to be absolutely certain that a friend or relative is totally trustworthy, too, and won't refuse to return your table. I hope you have this table appraised and insured, because it's absolutely priceless and irreplaceable. Good luck with your decision! Look for a climate controlled storage place. Cover lightly with a sheet to keep the dust off. Put roach traps all over the floor. I think an unheated storage space could damage your beautiful table in 2 ways. The unheated units allow more humidity. To me that would be the real danger. Wood glue has been the same for a long time. But there is no way to know what glue has been used. A friend of mine stored a saddle of mine in an unheated unit for a few months. She returned it covered in mold. It is such a beautiful piece that I would not take a chance on it. I would get a heated storage unit.